• Speed at 480rpm, energy saving, and low noise. • Casting cutting chamber is durable, hard engineering construction. • The blade is made by high-class steel with heating treatment, it provides the long service life. • High performance perforated screen in various sizes. • Easy maintenance, easy to clean, and easy to move. • Emergency stop button fitted to control panel. Note: • "v" standard, "O" optional. • Noise level will vary with different materials. • The max. 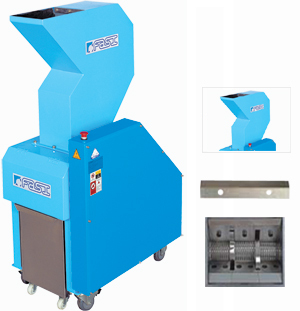 capacity of the machine is subject to the size and composition of processing materials. • Power supply: 3phase 380V, 50HZ, the special voltage upon requsested.